Christina Vantzou makes a dense, rich music that brings old-world classical textures into a contemporary electronic realm — and vice versa. She directs her own videos, drawing not only on the slow-motion aesthetic that guides her music, but also on the training she received as an art student in Baltimore, Maryland. Video is what brought her into music in the first place. She collaborated with, among others, Adam Wiltzie, of Stars of the Lid, and their work together culminated in recordings under the name the Dead Texan. Having lived in Brussels, Belgium, for over a decade, Vantzou has released a trio of solo albums whose evocative stasis never fully hides the sense of sheer effort that is required for her to consistently achieve this level of concerted, sublime quietude. This interview was timed to coincide with the release of her latest full-length record, NÂº3 (Kranky). She agreed to be interviewed, and after some phone calls we did this via email as a back-and-forth. 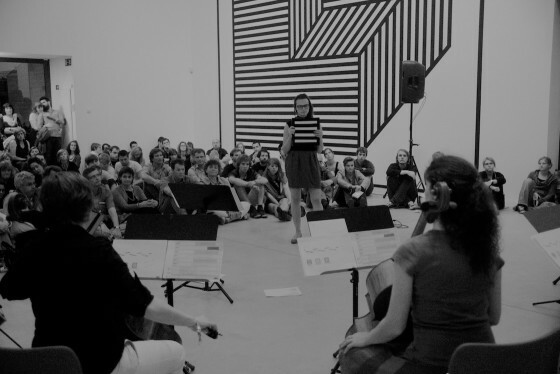 What follows is a lightly edited transcript of that discussion, in which she details her compositional process, describes how she interacts with chamber ensembles by utilizing graphic scores, and reveals that the sound she most wants to achieve may be that of an orchestra performing inside a giant bell jar. 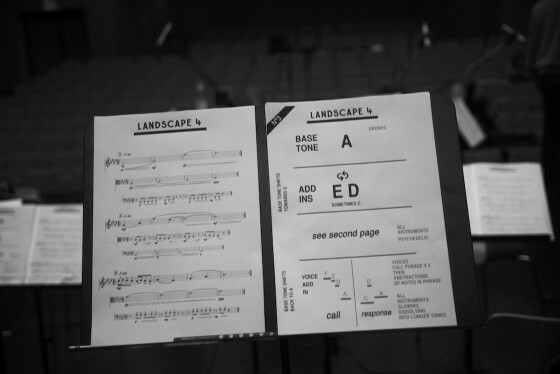 Her use of graphic scores and mid-performance flash cards bring to mind the experiments of Frank Zappa and, later, John Zorn. 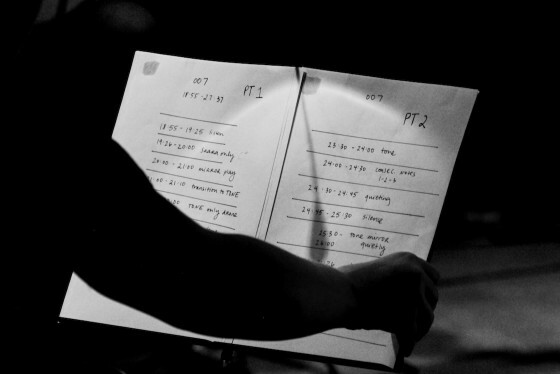 For one track on the new record the “score,” as she describes it, was a prepared recording that musicians listened to on headphones and responded to in real time. We discussed her graphicscores.com website, which she launched to explore common ground between visual artists and musicians, including John Also Bennett, Peter Broderick, and Julia Kent. Vantzou makes music that doesn’t so much blur the lines between what is broadly considered “classical” and “electronic,” as it is that she lets the two conceptions overlap until wonderful moiré patterns result from where they do and don’t inherently align. Marc Weidenbaum: Just to start with, what brought you to Brussels? Christina Vantzou: I was passing through. I was on my way to Greece. I’m half Greek, so I would travel to Greece a lot, and I had a plane flight that was rerouted through Brussels. So, I had an unexpected stop in Brussels, and I liked it and decided to stay. Well, I did go to Greece, but I ended up moving to Brussels not long after that. It was all these unexpected circumstances that introduced me to Brussels. I’ve been there since 2004. When I moved to Brussels I spoke the kind of French that you learn when you learn French in American schools, so very little, but I did take French classes in elementary school and high school. Weidenbaum: That’s around when the Dead Texan work came out. Vantzou: Yeah, the Dead Texan work started in transition from when I was living in Baltimore. I remember starting there and then continuing in Brussels. I was working on that for a couple years — 2003, 2004 — and then focused on touring with the Dead Texan the next few years. Weidenbaum: Please say a little about your art-school education. Weidenbaum: Were there instructors there who were especially instrumental in honing your sense of what you wanted to do? Vantzou: Yeah. There were two or three people in particular who were influential in their open-minded approach to being practicing artists in the world. I remember there was one teacher in particular. We spent a lot of the class time just watching music documentaries. We watched the Maysles Brothers’ Gimme Shelter, Ziggy Stardust and the Spiders from Mars, Don’t Look Back, about Bob Dylan, and on and on. Anyone could recommend one; we’d watch it. I got really interested in this genre and even thought, as a video artist at the time, that I would work in this field. I was really inspired by cinéma vérité and the artists making these documentaries. That particular class had a number of individuals in it who have become successful visual artists. I think the teacher inspired a lot of us. His name was Jeremy Sigler, and his class was called “Parapainting.”We also had to form bands as part of the class and each band played a show at the end of the semester. Weidenbaum: Your work in video lead to your association with Adam Wiltzie, of Stars of the Lid. The two of you then recorded and performed as the Dead Texan. I have one question about the Dead Texan period of your music, since it’s already pretty well-documented. Wiltzie has been widely quoted as saying that the music made by the Dead Texan took on a name other than Stars of the Lid because the Dead Texan music was “too aggressive”for Stars of the Lid. I’ve often wondered if he really meant it literally, or if he was joking. Vantzou: [Laughs.] Adam is very clever and he is smart enough to know that these few quotes that you let become part of the original press release — that quote about the music being “too aggressive”was in the press release that went out with the record — are being copy-pasted everywhere, and especially for a record like that, that enters the world through a network that’s relatively small. There’s just a lot of recycling of the wording from those press releases, so that one quote got printed over and over and over. He’s clever and he’s got a sense of humor, and he doesn’t take all of this too seriously, and if anything that quote is an example of that. Does that make sense? Weidenbaum: Yes, that makes perfect sense. It, I think, confirms something I’ve long thought about. Weidenbaum: It’s funny, also, how much it’s taken at face value, to have factual, direct meaning. I’ve always thought, I dunno, it feels like he was poking at something in a fun way, rather than making a clear distinction between two types of music. In any case, moving on, how did you come to work with graphic scores, in which images serve as visual compositions of non-traditional notation? They are central to your music production. I’ve always admired the work of people like Morton Feldman, and Stephen Vitiello, just to name two people, among many, associated with graphic scores. Vantzou: In the time that I was working on the first two albums, I had a few opportunities to perform, and each time I would be working with a quartet or a string trio or sometimes a string quintet, or however many string players I could get hold of. There was a very low budget, or no budget, and so I often worked with local musicians. So I’d gather up different ensembles in the different cities I would play, and there was also very short rehearsal time. It’s a lot of work, actually, to work that way, but that was necessary, and along with that necessity it became urgent to figure out a simplified way to work on the music with so many different groups of people. 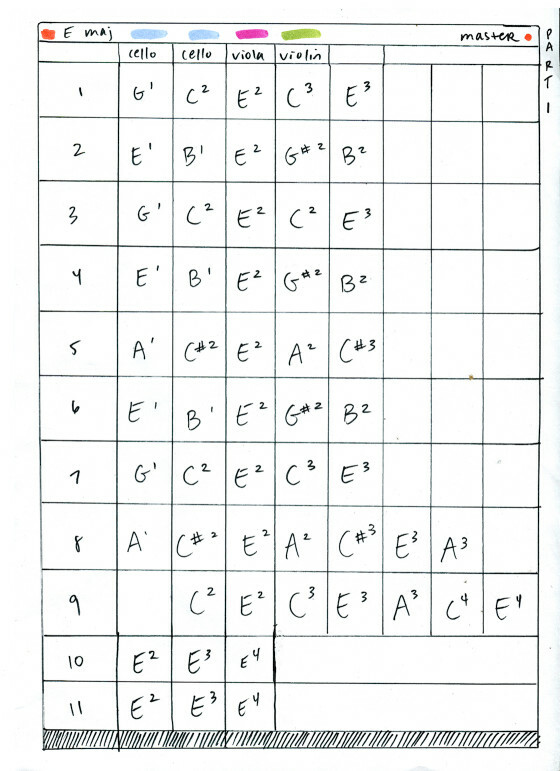 Given all of those restraints, and the fact that I don’t read or write musical notation in the classical sense, I had to come up with another way to communicate the musical structure to musicians. I needed a system where even if we only had time to rehearse some pieces in the set, the other pieces could be played because of their immediacy and simplicity. Rehearsals and concerts were smashed into one day, but I would have plenty of time leading up to concerts to work on these scores. The very first graphic scores I made were all by hand. Sometimes they just looked like MIDI sequences drawn out on paper, and sometimes I incorporated symbols. It was just a simple way of making a very rudimentary translation of the music for the group of musicians and the instruments I would be working with for a particular concert. That’s how I came about working out my own graphic scores. As I was doing that, I realized this was part of a bigger history of graphic. I found myself really interested to discover more about what its history was and who was involved and how it’s played out over time. Weidenbaum: When you produced the website graphicscores.com, how far along was that into your explorations into graphic scores? Vantzou: That was pretty far in. I organized that after NÂº2. I wrote friends, different musicians I’d played with, different people I’ve collaborated with, and artists and musicians that I thought would be interested in the project. I made a private call to friends to see who wanted to submit and the pieces that are on the website are the ones that were turned in. I’ve been meaning to do a second call. I plan to do that one day, but I haven’t found the time. Weidenbaum: The URL is a pretty great one. Was it readily available, or did it take effort to get it? Vantzou: The URL graphicscores.com was readily available. That’s kinda why I wanted to post them on a website, because as I was looking more into graphic scores, I was surprised by the lack of books that are floating around. There are two really beautiful ones that I know of. I don’t own them but I’ve looked at them. There are many people making graphic scores out there and you can find them here and there, some are very beautiful, but as far as I could tell a contemporary collection of graphic scores was nowhere to be found. 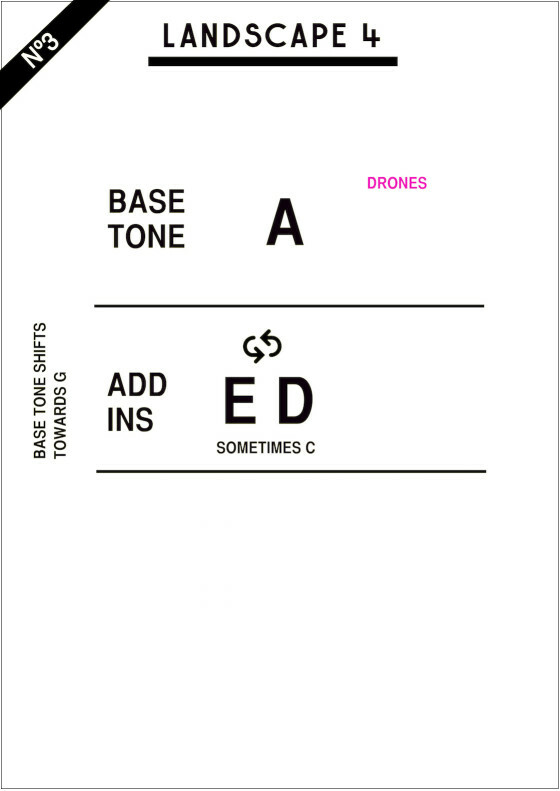 Weidenbaum: The only collection I have is Notations 21 by Theresa Sauer. Vantzou: And it’s a fat one, right, a hardback? Vantzou: That’s one of the ones I’ve seen. That’s really beautiful. Weidenbaum: You yourself employ at least three different ways of scoring with graphic notation. You make notes for yourself as a composer when creating music. You make static graphics that musicians then interpret. And you also use a flash-card system in which you conduct musicians by showing them images as they perform. Are these all interrelated, all part of the same graphic language, or do they form distinct categories? Vantzou: They’re all different. I used homemade flashcards a lot for NÂº1 and NÂº2. 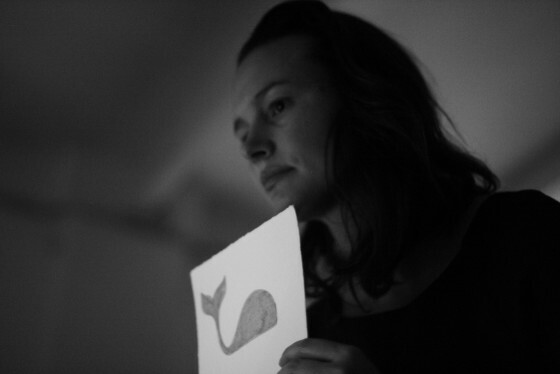 A big favorite was a whale drawn with a blue marker. The cards were helpful in that they provided some spontaneity. I was reading the Frank Zappa autobiography at the time, The Real Frank Zappa Book, and you really get a sense of him as a composer. I was inspired by how he worked with different classical groups and orchestras over the years. Apparently, when he auditioned musicians, he would introduce the idea of “cues”to them, to see if they could spontaneously change the flavor of their playing. Each cue involved a pop-culture reference. He’d say “Mister Rogers”and see if the musician could play with a Mister Rogers flair. He found that certain very skilled musicians couldn’t do that, so he used this as a filter and only brought in musicians who could add in the spontaneous flair. Reading that, I took from this the idea that you could play with spontaneity in a concert setting. Not improvisation, because there are clear parameters, but unrehearsed: Spontaneous. With classical instruments that’s very much against the rules. [Laughs.] It’s precisely the opposite of what you’re always told. It was educational for me, to see the musicians that I would work with get really excited about those kinds of things, because it felt pretty rebellious, I suppose, kind of a radical thing to do, counter to the sort of things that conservatories drill in. 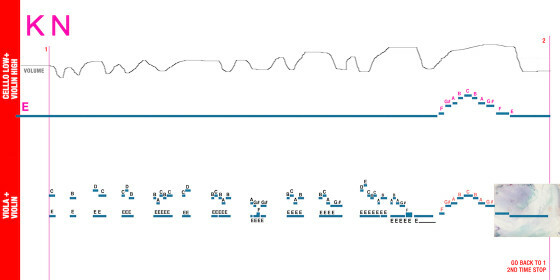 Weidenbaum: Were musicians generally responsive to the flash cards and graphic scores? Vantzou: Sure. At first I was intimated to introduce these ideas. I was nervous that the cards wouldn’t be well received. But looking back I can see that the music always attracted musicians who were open to these ideas. It’s clear from the music that there’s some experimentation involved. I’ve been fortunate that each time I’ve had the opportunity to collaborate with musicians on concerts or recordings, everyone’s been pretty open. Depending on the group, some warm up to certain ideas differently or more slowly than others, but everyone seems to come around. Weidenbaum: You started off doing art in the non-musical sense. And you did videos for other people’s music before you made videos for your own music. Now you create your own videos for all of your own music. Do you feel your own music is done when the music’s done, or do you feel like your musical work is not done until the video is completed? Vantzou: That’s a good question. I’ve been figuring out that the music is not done until the video is complete. I feel like, because of production timelines — both video and sound production taking years in some cases — it’s been challenging to sync up these production cycles — and so the tendency is that the music is completed first. Album NÂº1 clued me in, NÂº2 made this more clear, and now with NÂº3 I’ve got it. For NÂº4 I’d like to make sure videos are complete before sound is mastered. What I find is that the video really informs the music in a way that isn’t possible until the two are together. For NÂº3 I managed to do half and half. I did some early edits to the video so that I could — no, that’s not true. Actually, what I did, which is really what you’re not supposed to do, is this: so, there’s a track called “The Future”on NÂº3, and there’s also a video out there called “The Future.”I don’t think it’s very noticeable, but the mix on the video is different than the mix on the record. By the time I put the sound and video together I realized that the sound needed some work so I decided to go ahead and do that work and released the video with this slightly different mix. I guess in a perfect world I would have done that before mastering so both versions are identical, but anyways, that’s how it went. Weidenbaum: One thing that fascinates me about your music is how it is bookended visually. It begins as these visual compositions, these graphic scores, and it ends as these videos, without which, as you’ve said, the music isn’t really fully done. Does that conception register with you, of your music hovering between these two visual expressions? Vantzou: I didn’t quite think of it like that but, yeah, for sure. It definitely works like that. I collect visuals continually. Image collecting is a big part of starting a new record, quite a big part, even more than the visual scores. Weidenbaum: How do these found images inform the music? Vantzou: I habitually save images into folders. I think a lot of my visual artist friends do the same thing. I used to collect images from magazines and rip pages out. Now I image grab from Instagram and Google. Working on new musical ideas, I definitely look at these images and I sometime send these images to collaborators. It’s really helpful when music has an image attached. The two are really linked. That’s why record covers work so well. Vantzou: Right, true, yeah, I guess I’m putting together some kind of a mood board, for sure. And those same images are also part of the mood-board reference for the videos. Weidenbaum: Some graphic scores, such as yours, are recognizable as structured notation — like those of Xenakis and Stockhausen, which yours resemble. But then there are other people, like, say, Christian Marclay, who find music in everyday, pre-existing images. Do you ever use preexisting images as scores? Vantzou: I tried using photographs once as graphic scores. I think given more time, it could have ended up differently, but that particular attempt I was trying a lot of ideas in one evening so when I passed around the image, it felt like it made way for a very open-ended improvisation and nothing more. And because the players had played together before, the open-ended improvisation went down a very familiar-sounding road. That’s when improvisation is not improvisation anymore. So, that didn’t work, but we explored it. 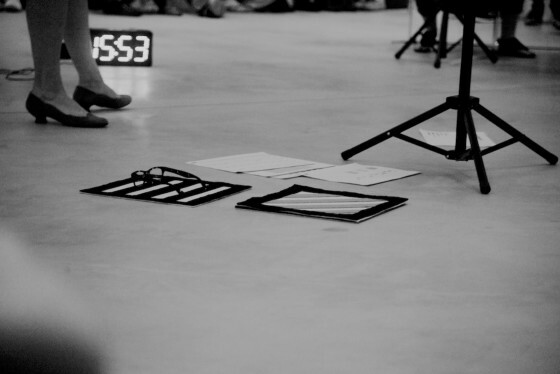 What I mostly learned out of trying out graphic scores, was that isolating a certain progression of notes, or even just selecting very few notes that musicians can play, really works. For NÂº3, that’s the direction I went with graphic scores: on “Entanglement”I defined a bass-tone note and let the instruments in the higher registers choose between two or three notes that were harmonious together, and just let the whole orchestra make a cloud of sound based on those simple parameters. Weidenbaum: Can you elaborate on the phrase “cloud of sound”? It registers with me as a description of what you do. Is that something you knew for a long time that you wanted to achieve? Is it something you are still striving to accomplish, or having accomplished it are you now creating different clouds? Vantzou: When I was starting NÂº3, I knew I wanted to work with a large ensemble and with everyone present in the room at the same time rather than recording solo or sectioned instruments and overdubbing. I felt like I was able to create the cloud of sound on NÂº1 and NÂº2, but it was in post-production. I really wanted to try to get there acoustically. I figured the best shot at getting there would be to have an orchestra. I ended up working with a 15-piece chamber orchestra called the Chamber Players. 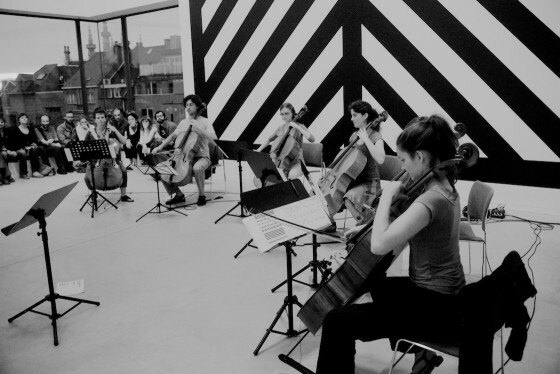 Before NÂº3 was released I did three concerts in Belgium with the Chamber Players. The third of these concerts was in August, and I was really happy with the “sound cloud”that we made. It took some time to get there. There’s a certain quality that’s actually quite difficult to achieve, which is restraint from musicians. I have a friend here in Belgium, Neil Leiter, who plays with A Winged Victory for the Sullen, he also plays with me sometimes, and he has a lot of experience playing chamber music with his quartet and the Liege Philharmonic Orchestra. He’s had a lot of experience, is very classically trained, plays beautifully, and often he plays extremely quietly. This helped me see that a certain level of restraint is the right ingredient to a certain quality of sound from strings. To try to get a whole orchestra to play with this quality is kind of a paradox, in a way. I’m trying to create an ambient, layered, “sound cloud”thing — funny, “SoundCloud”[laughs] — which is sort of very new in terms of the orchestra tradition because it undermines the notion of a soloist and therefore the entire hierarchy of the orchestra. Big no-no. At the same time the soft cloud of sound is quite a mature sound that demands a lot from the musicians. There’s also a level of trust in there. We just learned over time to work together in this way. By the third concert I was really pleased because it felt like we’d found our way into that soft sound zone. Weidenbaum: Is there much post-production on those orchestral tracks? Vantzou: Extremely a lot, yeah. Weidenbaum: Is it more of an additive, layered process, or a subtractive, whittling-away process? Weidenbaum: Please choose a piece from the new album and talk through its development. Vantzou: “Valley Drone”is the first track on the record. 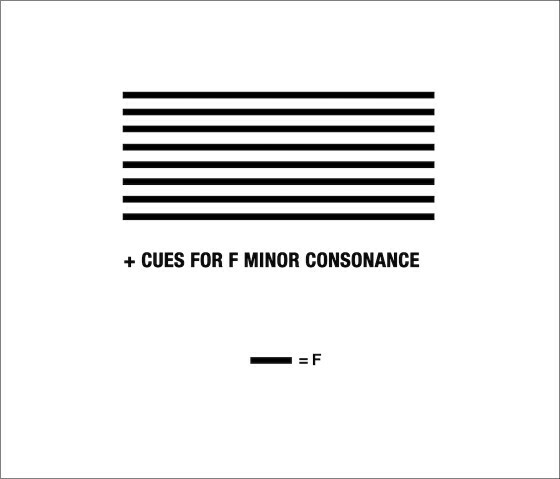 It is in the key of F and the instructions for the orchestra were to move from a low F to a higher F, into overtones. You hear it in the recording. It’s very bass-y to begin with and then there’s some really light playing at the end; the strings play these soft, high overtones. Those were the instructions and we recorded it; the whole orchestra played this together. Mics were placed in such a way that there was low bleed. It was a really well mic’d-up situation. However, you can’t eliminate bleed all together. By the way, what I’m describing is probably my most extreme level of erasing. In fact when I was mixing this one I went so far into the subtraction that I worried a bit. I didn’t want to offend anybody but the orchestra was getting rather erased. What I did was, I brought everyone down in the mix, besides the cello. I played it for a few of my close friends as I was working on the early mixes — friends who knew the previous records — and one of these friends, Peter Burr, said, “So, when you play this live, you just have to figure out a way to construct a huge bell jar to put over the entire orchestra except the cello player.”That was so brilliant because it’s exactly what I would like to do. It would be perfect. I would still love to do that one day. Someone just has to fabricate the bell jar. Weidenbaum: I often say that it’s not that I don’t like dance music. It’s just that I prefer to listen to it from the other size of a thick wall. Vantzou: Right. Last year, I got to go to an opera in Belgium. There was a production of Akhnaten, the Philip Glass opera. And my favorite part, musically — well, it’s hard to say what my favorite part is. I love the strings in the very beginning but there was also a moment where the entire chorus was singing from backstage. You heard it in this subdued, muted way, and it was gorgeous. Apparently it’s a typical kind of thing in opera but it would be a little bit strange to ask an entire orchestra to play a concert from backstage. For the mix, though, that’s kind of what I did. I made them sound like they were next door. Then I added the bass drum, recorded separately, into “Valley Drone”and laid tons of synths on top. So there’s this bell jar with the cello left outside and then a bunch of synths melted on top. I de-tuned the orchestra very slightly in post-production too. I was really excited about these sounds, but a part of me also felt terrified in going this far, so when I first met with the orchestra director, David Anne, to play the final mixes I was a little worried. David was extremely lovely to work with. He has worked in Belgium as an orchestra conductor for over 20 years, and is a composer himself. He was a huge part of NÂº3. When I first played him that “Valley Drone”mix, he said, “But I don’t even hear the flute.”The orchestra and I were definitely coming from very different places, but that was the beauty of this collaboration. It was a way for us both to step out of our comfort zones. [Laughs.] I haven’t actually gotten the opportunity to relay all of that until this conversation. Weidenbaum: Why is there a track named after the electronic musician Laurie Spiegel? Vantzou: That one is also a story that has not quite been made clear yet. This was an idea that I’d been wanting to try on previous records, but there simply never was time. I took samples from Laurie Spiegel’s The Expanding Universe, added a lot of reverb, and collaged together a very pastel, tonal, ambient five-minute piece. I let the orchestra listen to this five-minute sound collage through headphones and play what they were hearing, mirroring the sound. No scores. First the strings played, we recorded the full five minutes, and it was gorgeous. In a live situation, I would love to present that as a string piece. Then we did single takes with each section of the orchestra: horns, winds, voices, vibes. Weidenbaum: So you’re playing them a warped piece of her music, and they’re responding to it, not really performing it? Vantzou: Yes, and it’s called “Laurie Spiegel”because it started with her. And of course it’s important that it started with her. I have that role. I’ve come into the picture after a great deal of experimentation and I feel there’s certainly a lack of exposure of women’s work in this field, which is really unfortunate. Weidenbaum: Yeah, I think her name’s appearance in the track listing serves that purpose. In a way, it’s like the “too aggressive”description we talked about earlier: a very simple use of language that accomplishes a lot. Vantzou: And it’s my favorite track on the record. Weidenbaum: Do you use the Eurorack synthesizer to some extent? Did I read that correctly? Vantzou: The Eurorack synthesizers, and all the other synths on the record, were the contribution of John Also Bennett. He’s a New York”“based synthesist who plays with Forma, and he’s one half of a music project, Seabat. Soon after NÂº2 was out, I heard the Seabat album Scattered Disc, and I really loved it. I asked him to do a remix for NÂº2. Weidenbaum: He was also part of your graphicscores.com project? Vantzou: Yes he did a graphic score. He was one of the people I thought would be interested in doing one. And the other member of Seabat, Forest Christenson, also did a beautiful graphic score. After the recordings with the orchestra were complete, I knew I wanted to do a lot of post-production on the record, and I thought John might be a good person to work with on the synth parts. So, I wrote him and asked if he would want to work with me and he ended up doing all the synth recordings on NÂº3. We used a Juno, a DX7, and a bunch of his modular synths. Weidenbaum: Because your music is so subdued at times, it can feel like everyday sound as much as it might like, say, “music.”I saw a video interview with you in which you said you could use your notation system to write down music in your head when you only had pen and paper, like if you’re on a train. Do you ever notate everyday sounds? Is you work informed by what you hear on a daily basis? Or do you work purely in the realm of music? Vantzou: I’ve never tried to notate everyday sounds, but I notice my ears getting more sensitive having spent a lot of time working with sound. Getting the experience of working with different engineers, going into different recording studios, hearing the subtle differences of what a mastering session can do — you start to sensitize your ears. And so, for sure, a side effect is that I notice my environment differently. It’s made me want to do more field recording work, if nothing else. Field recording’s become easier and easier with all these really great portable recorders. And anyone can decide to sensitize themselves to their environment. All M-Museum performance photos by Julie Calbert. Transcription assistance by Thomas Karabatsos. More from Christina Vantzou at christinavantzou.com and soundcloud.com/christinavantzou. More on her latest album, NÂº3, at brainwashed.com.